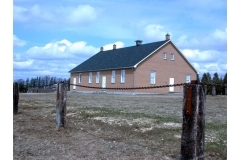 The Farewell Old Order Mennonite meetinghouse is located in Wellington North Township, Wellington County, on the east side of Concession 11, 5 km. west of Highway 6, and midway between Kenilworth and Mount Forest, Ontario. The Mount Forest area was first settled by Old Order Mennonites from Waterloo County, Ontario in 1967, several years after the first farms were purchased in 1964. This movement to the Mount Forest area resulted from the expansion of urban areas of Waterloo County into the Old Order community, and the rising cost of agricultural land in Waterloo County. The first meetinghouse (Spring Creek) in the Mount Forest area was built in 1972 on Concession 6 of what was then Arthur Township. At that time 19 families lived in the surrounding community. On 29 November 1972 Melvin Sauder was ordained as the first deacon; on 23 October 1973 Elam Weber was ordained as the minister. As is the practice in Old Order churches, they were ordained by lot from within the congregation. Ordained persons are not paid for their church service. In 1978 the church purchased a parcel of land from Urias Weber for the Farewell meetinghouse which was erected in 1979. Minister Elam Weber and Deacon Melvin Sauder then were transferred to serve the new Farewell congregation. The first burial in the Farewell cemetery took place after the accidental death on 28 December 1979 of Henry M. Martin, a 23 year old man who had been married only a few months. From 1993 to 1997 the Farewell congregation was split in to East and West districts, as the number of families had reached 60, with a wide distance between the eastern and western boundaries. Another meetinghouse (Westdale) was then built to address this growth. In 2004 the number of families in the Farewell district was slightly over 40. No accurate count of "members" is available because Old Order Mennonites think of themselves as members of the church at large not just the immediate congregation. When a person moves from one geographical area to another, he automatically "belongs" to the congregation whose meetinghouse is closest to his home. No membership transfer takes place from the former location. Please respect the privacy of the Mennonite community by not taking pictures as they live, work and play in our community.